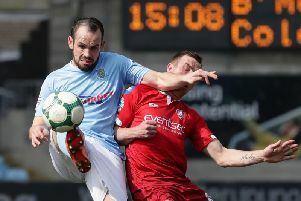 Ballymena United secured a top six finish in the Danske Bank Premiership by beating Ballinamallard United 2-0 at The Showgrounds on Monday night. Teenager Matthew Shevlin got both goals inside the opening quarter of an hour. The win sends Ballymena above Glentoran and will play the top five in the table in their remaining fixtures. Ballymena took the lead in the seventh minute when Shevlin fired in from six yards after Tony Kane’s free-kick was palmed out by keeper Richard Brush. Shevlin got his and Ballymena’s second on the quarter hour, picking the ball up on halfway and going to to net a low shot from about 12 yards.